Treat your elbow pain by acupuncture with MD specialist doctor with 40 year experience at modern 4.5 star* rated clinic with dedicated staff in Nashik. No drugs or its side effects! Tennis elbow makes holding objects in hand painful. You may have tenderness on outside of elbow, morning stiffness and soreness of fore arm muscles. Cures for tennis elbow symptoms needs patience as it takes long time to heal. Full range of motion of elbow is maintained, as the inner joint is not affected, but the pain is usually more evident toward the end of the day. Twisting motions or activities that strain the tendon generally gives more elbow pain. The elbow is the joint is formed by three long bones humerus, radius and ulna in the middle portion of the arm. Elbow is hinge joint but also allows medial and lateral rotation. Fluid-filled sac, olecranon bursa, serves to reduce friction, overlies the tip of the elbow. Two sides of elbow joints called medial and lateral epicondyles are affected by injury resulting into golfers elbow and tennis elbow. Tennis elbow (lateral epicondylitis), golfer’s elbow (medial epicondylitis), olecranon bursitis, elbow sprain, broken elbow, arthritis of the elbow are major causes of elbow pain. 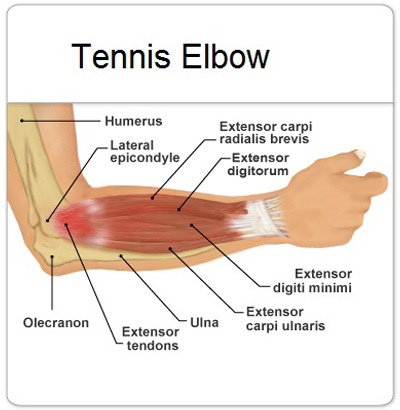 Tennis elbow is also called lateral epicondylitis. Repetitive motions of the forearm, such as using a manual screwdriver, washing windows, or hitting a backhand in tennis play can injure and inflame of large tendons attached to the lateral epicondyle of elbow from the muscles of the forearm. The elbow bone pain is generally on the outside of the elbow and might be accompanied by warmth and swelling. Tennis elbow test is generally not required as history and signs make it evident. Acupuncture as tennis elbow treatment Acupuncture can be helpful for relieving the symptoms of tendonitis and tennis elbow. It relives tennis elbow pain by stimulating release of endorphins and other neurohumoral factors. It causes changes the processing of pain in the brain and spinal cord, delivering analgesia via alpha-adrenoceptor mechanisms, increasing the release of adenosine, which has antinociceptive properties, modulating the limbic-paralimbic-neocortical network, reducing inflammation, by promoting release of vascular and immunomodulatory factors and improving muscle stiffness and joint mobility by increasing local microcirculation which aids dispersal of swelling. Apart from usual analgesics, Corticosteroid injection into joint space may help it. Giving injection more frequently may weaken tendons and ligaments and may rupture. Injecting few ml patients own blood into joints may help it to heal faster. Tennis elbow therapy includes freezing water with towel for 20 minutes may decrease inflammation and give some relief. Tennis elbow pain relief need rest to give some time to heal. Tennis elbow physiotherapy treatment needs to be started after pain has reduced substantially. Tennis elbow treatment brace or tennis elbow strap can be used to restrict movements. Exercises for tennis elbow pain relief can be started only after pain has subsided. Tennis elbow exercise can help in certain extent. Over the counter medicines like ibuprofen will give temporary relief. Tennis elbow surgery can be considered in tennis elbow does not heal for one year. It involves shortening tendon and reattaching to bone. With availability of acupuncture treatment, need of surgery is now minimised. 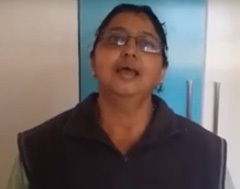 Patients report having taken Ayurvedic treatment for tennis elbow pain and reported some relief also. Similarly, Homeopathic treatment for tennis elbow pain has also had some satisfied patients. Acupressure treatment for tennis elbow pain has limited scope. Yoga treatment for tennis elbow pain, especially due to inflammation and can be effective. Yoga involving pressure on elbow or stretching or rotation of arm can irritate nerve and exacerbate complaints. Similarly Tai Chi treatment for tennis elbow pain is effective. Qigong treatment for tennis elbow pain needs special training and can be useful tool of management. Respect warning signal of pain from body when doing exercises. Exercises must be slowly progressive. Sudden load on muscles or must be avoided. Size of racquet needs to be appropriate. Grip has to be as per requirements. Holding of racquet needs to be proper. There should be no over extension or over flexion of wrist during stroke. Take rest on first sign of soreness. Tennis elbow games need to be played technically well to avoid pain. Tennis elbow rehab takes time and need to be undertaken under expert advice. Treat your pain of tennis elbow by acupuncture and get instant relief. No drugs or its side effects. Become pain free with MD specialist doctor with 40 years at modern 4.5 star* rated clinic with dedicated staff! 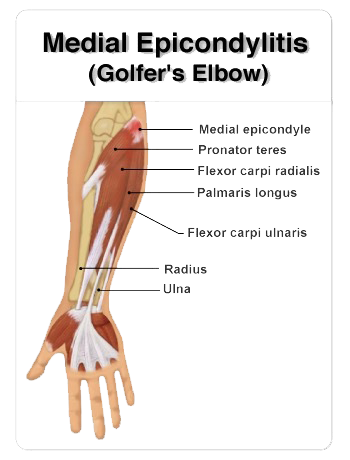 Golfer’s elbow is characterized by tenderness over the inner elbow bony knob and local pain. It is felt more while bending elbow. Inner joint of the elbow is not affected therefore range of motion of the elbow is preserved. Those actions which require twisting or straining the forearm tendon can reproduce pain and worsen the pain. It is also called medial epicondylitis. Causes of golfers elbow are Golf, tennis and other racquet sports, bowling, football, archery, cricket, carpentry, plumbing and raking. Golfer's elbow causes are avoidable factors. It is inflammation at the area where the tendons of the forearm attach to the bony prominence of the inner elbow joint. This tendon can become strained in many other repetitive motions can injure the tendon like a golf swing, rotating arm, and flexion of wrist. The injury can also be by sports requiring such muscle action. People using screw drivers, hammers raking or painting in house can also suffer from Golfers elbow. Repetitive injury can cause tiny tear or pulls in tendon. It should be first line of treatment for immediate pain relief followed by rest to elbow. Acupuncture relives pain immediacy which can be followed by conservative management. Ice cold towel wrap and rest to part may help to reduce inflammation and allow it to heal. Medication for golfers elbow Ibuprofen will help to reduce inflammation and relive some pain. Corticosteroid injection may relieve pain for some time. Physiotherapy with gradual stretching may relieve pain slowly over six months. Golfers elbow exercises have some role in its management. Tennis elbow cure may take year or so in certain cases. Ligaments can be injured during a sprain causing stretch or tear injury. It may occur when the elbow jammed, such as in a “stiff arm” collision or hyper-extended. The severity of the injury will depend on the extent of injury to a single ligament (whether the tear is partial or complete) and the number of ligaments involved. Injury or minor trauma, as a result of systemic diseases such as gout or rheumatoid arthritis, local infection causing inflammation of the bursa at the tip of the elbow can result into Olecranon bursitis. Range of motion of the inner elbow joint is maintained in Olecranon bursitis and is associated with swelling over the tip of the elbow. If you have any question regarding pain of Olecranon bursitis treatment in Nashik or treatment for tennis elbow pain please is in touch with us for free advice. Arthritis of the Elbow Inflammation of the elbow joint can occur as part of arthritis. 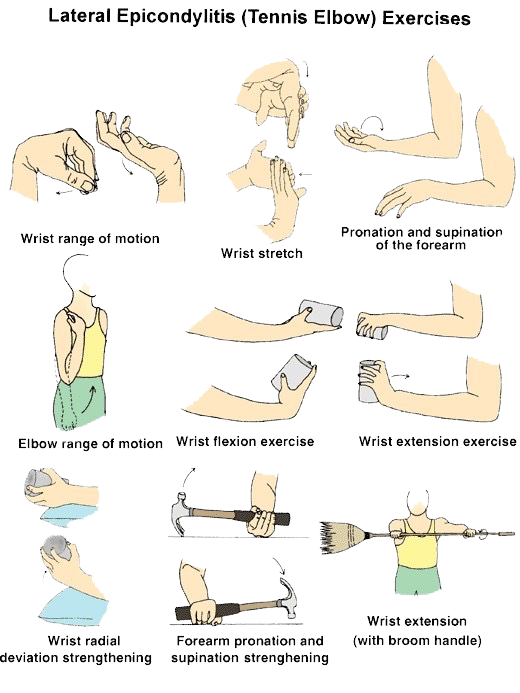 They are associated pain, tenderness and decreased range of motion along with signs of inflammation of the elbow joint. Elbow Fracture The bones of the elbow can break (fracture) into the elbow joint or adjacent to the elbow joint. Fractures generally require immobilization and casts and can require orthopaedic pinning or open joint surgery. Acupuncture can help to relive pain. Elbow fracture pain treatment is effectively done by acupuncture. Fracture itself will need appropriate management.